Prezi Presentation Template with a cooking concept. Various cooking equipment on a dark kitchen surface. Move the graphics around, add your own – zoom anywhere to create an interesting food related Prezi. 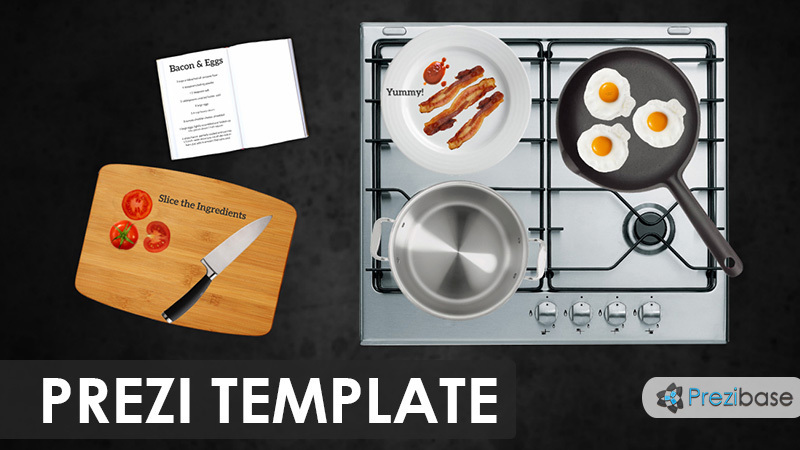 Elements included: pot, pan, egg, knife, bacon, stove, tomatoes, cooking book, plate, cutting board. Present about eating, dieting, healthy life, lunch meals, restaurant menus, cooking classes, good recipes. This entry was posted in Best Prezi presentation templates and tagged Best Food, book, chef, cook, cooking, cutting board, diet, eat, eating, egg, finger, health, ketchup, kitchen, pan, plate, pot, prezi template, prezi templates, recipe, restaurant, salad, sausage, snacks, stove, tomotoes, treats, viener.